The Tu-4 is a rank IV Russian bomber with a battle rating of 7.3 (AB), 8.0 (RB), and 7.7 (SB). It was introduced in Update 1.59 "Flaming Arrows". Though its structure is a copy of the American B-29 bomber, the Tu-4 features an improved 23 mm defensive armament and a very large payload. Russian engineers reverse engineered an interred B-29 to develop an "exact" copy per Stalin's request. Challenges were met as available materials were developed using the metric system and the B-29 had been developed using the standard imperial system. Equipment had to be retooled and new supplies had to be developed to match the metric version of the imperial standard sizes. 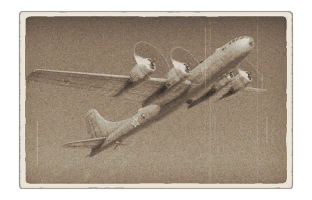 In the end, between the two aircraft, the Russian Tu-4 only weighted 340 kg more than the B-29, a difference of less than 1%. So stringent was the bureaucratic process for manufacturing parts and equipment, special permission from a high level general was required to allow Soviet made parachutes to be utilized in the Tu-4. The Tu-4 is a heavy bomber, able to load up to 12,000 kg of bombs. It is able to fully destroy all three bases in one run, while also dealing significant damage to the enemy's airfield. Its defensive armament consists of 5 x turrets with each having 2 x 23 mm cannons (a total of 10 x 23 mm cannons). These guns can annihilate enemy fliers in seconds while covering a wide area, making a Tu-4 tough to approach, let alone attack. However, don't be fooled, it is a huge target and thus nearly impossible to miss. With it's battle rating of 8.0 in RB, it faces top rank jet fighters most of the time. 60 mm Bulletproof glass in front of the pilots. 6.5 mm Steel plates in front of the pilots. 6.5 mm Steel plates behind the pilots. 6.5 mm Steel plates in front of tail control tractions. 6.5 mm Steel plates boxing around rear dorsal gunner and beam gunners. 6.5 mm Steel plate behind rear ventral turret. 60 mm Bulletproof glass in front of tail gunner. 6.5 mm Steel plate in front of tail gunner. Like most planes of its class, the Tu-4 relies on its defensive turrets for aerial combat. A few good hits from its 10 x 23 mm guns can send an attacker back to base, with critical damage or, if not, credit the player with the victory. Maxing out the crew stats is a good idea, it will allow the player to focus more on flying while the AI does the gunning. Don't get too arrogant, remember, the Tu-4 is a huge plane. It is easy to hit, and as mentioned above, especially when the opponents could be jets. All in all, pay attention to the surroundings. The Tu-4 can easily net the team a win so don't let the feeling of invincibility get imbued, or the only reward will be a fiery end. When first starting with this aircraft, the payload option is 40 x 100 kg bombs which are able to destroy numerous bases. One of the best ways to maximize the payload's effectiveness, 15 x 100 kg bombs are needed for one base. The A.I. gunners will be able to defend the plane as bombs are dropped from the bomb sight until switching back to the pilot seat, ready to head to next objective. Once the Tu-4's bombing run is complete, start descending towards the friendly airfield; enemy fighters will be hunting for the Tu-4, so be more alert. The Tu-4 has a very powerful defensive systems installed with 5 turrets, each with two 2 x 23 mm cannons, so the Tu-4 should be able to defend itself reasonably well. Do not rely on the AI gunners. Most of the time the Tu-4 will face top rank jets including Hunter F 1s and F2 Sabres. These adversaries are usually experienced and will not foolishly tail the bomber for long and try to engage at ranges greater than 1 km or engage in a head-on pass. These manoeuvres render the AI gunners largely useless. Laying down a stream of 23 mm rounds is recommended. Hits can be scored within 1.5 - 2 km, if somebody is tailing the Tu-4 or engaging in a head-on pass, they can also occur at greater ranges. Combine the turret shooting with a defensive style of flying to utilize it to its full potential; the Tu-4 offers good handling for its size. Be very careful when putting the Tu-4 into a dive. It is just as prone as any other aircraft to suffering structural damage if its limitations are exceeded. The two most dangerous opponents of the Tu-4 are the S.O.4050 Vautour IIA and the Hunter F 1. With their 30mm cannons, one burst will be devastating against the Tu-4. The F-86F-2 is also a dangerous opponent, with four 20 mm cannons with a very high velocity and rate of fire. When downtiered, the most dangerous opponents are the Me 163 B, the Me 262 C-2b and the R2Y2 KAIs. 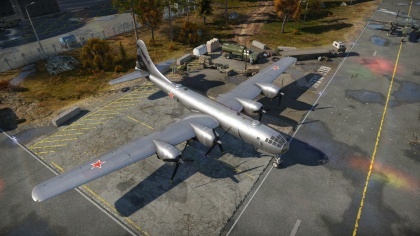 All equipped with 30 mm cannons, they are able to send the Tu-4 back to the hangar within one burst. Don't underestimate the other Sabres, such as the F-86F-40 and the CL-13A. Their 12.7 mm machine guns can do a lot of damage, crippling or setting the Tu-4 afire, which could end the match for the plane there. Do not be fooled of its nickname of "The Russian Death Star". Even with its powerful defensive armament, it does have weak spots. While playing the Hunter F 1 or the Vautour IIA, it is easy to send this monster of an aircraft back to base with just one burst. Engaging in a head on is recommended, as the pilots have little protection, usually knocking them both out. The Tu-4 is a monster of an aircraft, making it very easy to hit. Wings, and the tail control are weak spots, so hitting the wings will result into severe wing damage on the Tu-4, forcing it to return to base or even sending it back to the hangar. While flying the Sabres, try to aim for the fuel tanks in the wings. Most of the time, just set the fuel tanks ablaze, or even blowing off the wing, sending the foe back to the hangar. Do not engage the Tu-4 from the six! Engaging the Tu-4 at its tail, especially from below, is asking for trouble. Always try to engage the Tu-4 from the top, or in head-ons, the fuselage turrets have dead zones when engaging from >~70 degrees. This page was last edited on 11 April 2019, at 09:42.